Feb. 21, 2019 (Case Western University) -- Bacteria in the gut do far more than help digest food in the stomachs of their hosts, they can also tell the genes in their mammalian hosts what to do. A study published today in Cell describes a form of "interspecies communication" in which bacteria secrete a specific molecule -- nitric oxide -- that allows them to communicate with and control their hosts' DNA, and suggests that the conversation between the two may broadly influence human health. The researchers out of Case Western Reserve University School of Medicine, University Hospitals Cleveland Medical Center, and Harvard Medical School tracked nitric oxide secreted by gut bacteria inside tiny worms (C. elegans, a common mammalian laboratory model). Nitric oxide secreted by gut bacteria attached to thousands of host proteins, completely changing a worm's ability to regulate its own gene expression. The study is the first to show gut bacteria can tap into nitric oxide networks ubiquitous in mammals, including humans. Nitric oxide attaches to human proteins in a carefully regulated manner -- a process known as S-nitrosylation -- and disruptions are broadly implicated in diseases such as Alzheimer's, Parkinson's, asthma, diabetes, heart disease, and cancer. 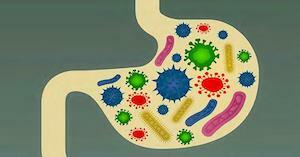 The findings suggest nitric oxide is a general mechanism by which gut bacteria can communicate with mammalian hosts.